Budgets buy freedom. Budgets do not buy fancy date nights (not in the short term anyway). This simple fact is one of the hardest parts about adjusting your personal spending to make it sustainable. After all, you still want to have a great time connecting with your partner in a meaningful way. 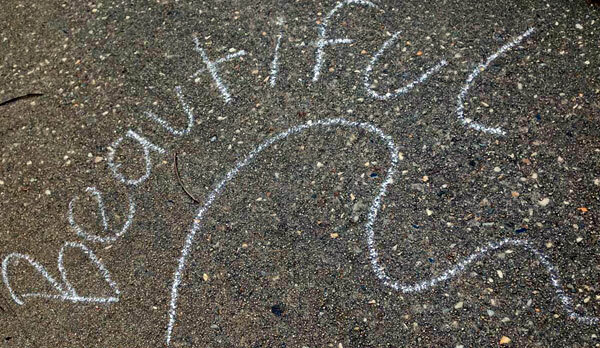 Arrive at the start of your chalk trail and just pretend like you are going for a walk. The trick is to just keep going and see if she notices the trail! When she finally does (which could take a hint or two) she will be a little surprised and intrigued which is what makes this date totally memorable! If your budget stretches to the lofty heights of $20 you could finish off the date day with a street vendor style meal in the park! Follow the directions on the app until you find where the Cache is hidden. This is the best part – searching! Lastly, swap out one of the mementos in the box with one you brought along so you have a keepsake of the date. This is a great date since the hunting and searching gives you enough small talk to get the conversation flowing. It is also a heap of fun when you finally find the treasure together! Basically one of you will be making the main meal and the other dessert. The fun part is that you each choose the ingredients that other has to use! You then split up and have a $10 budget each to find some ingredients. Be nice and get things that do not require too much creativity (unless of course rhubarb is your thing…) You can make this even more fun by sneaking around the store trying to keep what you are buying for each other a secret! You can make up and ‘house rules’ you like as well as using anything in the cupboard/fridge to make it easier too. My wife used to always want to do ‘house stuff’ – you know, renovate the backyard, paint the kitchen table, or put photos in frames and arrange them on the wall. My response was usually ‘Sure babe’ + <internal grown>. That was until I realised that doing house DIY stuff is just another way to hang out. Almost overnight my whole experience changed and I’d be asking her to do stuff. Give it a go on 1 or 2 projects and see what you think. It really can be a fun date night. Coffee table made of books – a pile of hardcover books, a chopping board, and some glue, and you can have a totally hipster coffee table! This can be customised to fit most home decors – we put music sheets on top of ours, but you could just as easily paint it or stick photos on top, etc. Map board – this is a cork notice board with a world map glued on top that’s marked at every place you’ve been! It also makes a great conversation starter when you have friends around. 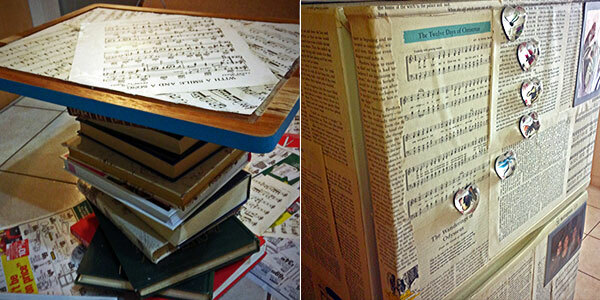 Paper fridge – all you need is an old book, some spray glue and a (older) fridge! You have to get past that strange feeling that you shouldn’t be plastering paper all over a fridge, but once you do it’s a really fun date. We had planned to cover ours in varnish to make it last longer but never got there and it seems to be holding up pretty well! 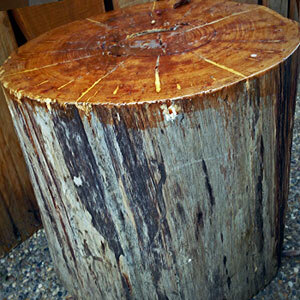 Wooden stump chair/table – this one’s really easy once you have the stump. Just plane it back and seal it for a really useful outdoor piece of furniture! To get the stump, check the local firewood suppliers or grab one off a friend who has a property in the country. Pinterest! Simply search for ‘DIY home date’ and a bunch of other fun stuff will come up. Once you’ve been together for a while you will have been out for drinks endlessly. This can get a little boring since you run out of things to talk about. You can make it fresh by coming as a different person for the night! It’s pretty straight forward really – you both plan a night by yourselves to meet a ‘friend’ for a drink. When you get there, go and ‘pick up’ your partner who will now have a different name, job, back story, life goals, sexual interests, hobbies etc… If you’re cool enough to bust out a different accent it totally adds to the awesomeness. This makes for a really fun date because keeping the performance brings back all those novelty feelings you had when you first met! Furthermore, trying to keep a straight face when you’re talking about your long standing passion for competitive hot dog eating is a real art! You can make it even better Googling your new hobby and finding some cool stories to share on the night. Try ’em out and let us know what you think! What type of fun dates have you gone on? About the author: My wife and I use to go on epic dates. Live theatre, $130 dinners, big presents – you name it! Then we both started businesses and had to shrink our budget. Gone were the nice dinners. Gone were the $300 weekends. Gone was my feeling of male pride that I wasn’t able to pay for everything! We needed to find date night ideas that were affordable but still fun – we have put the best of these online at DateNightWingman.com. PS: Here are 8 more fun (and frugal) date ideas we’ve blogged about before. LMAO. This is like the beginning scene of 4 Christmases. Not that great of a movie but that first scene is pretty funny. Whatever floats your boat I guess…. That one was my favorite too :) The wife every now and then will go a whole night speaking in a British accent which I just love! But then she gets mad at me when I want her to continue doing it forever and she won’t – hah. For sure – totally flogged the idea from their! I love geocaching. 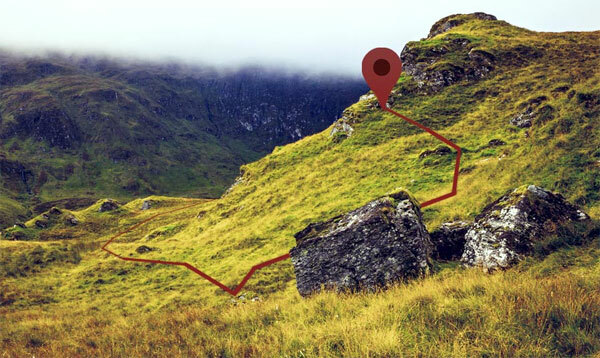 The thrill of the hunt is where it’s at, it’s like a modern day adventure using tech. It’s fun for sure… Same with metal detecting too! Though in that case you get to *keep* whatever you find :) Which could be nothing but bottle caps or – if you’re lucky – old coins or jewelry! I meant to hit up the beaches in the evenings but didn’t get to it on our trip – boo…. First I have to thank @estabrooksm, who added me to his list, “estabrooksm/personal-finance,” and also @BrokeMillennial, whose tweet I saw there just now, for leading me to your fun post today, J$. Thank you, folks! Great ideas! I love that most of these turn ways to save money into a date. All the diy stuff haha. I should try that on my husband. Let’s go on a date and make furniture together!!!!!! Or maybe I shouldn’t tell him what we’re doing. It was the powertools that really sold me! Haha #5 is awesome. My wife will probably laugh at me when I pitch that later on. Geocaching love! I’ve been doing it since before smart phones, so I actually have an old school GPS handheld. It doesn’t give directions or topography or anything, just straight lines and distances after it takes 3 minutes to triangulate. The husband calls it the dork machine. Well these are awesomely fun ideas! I’m recently engaged, and tomorrow will mark 4 years being together! Maybe we can bust some of these out ;-). Especially that “be a different person” is a fun one. I was just discussing with my partner not too long ago that when we met, we were such different people. I wonder what it would be like to meet now? Great post! Hope vacation is awesome! I used to try to get my husband (boyfriend at the time) to do the cooking idea with me, but he would always choose frozen pizza and beer and then practically pee his pants laughing when I told him he was not keeping with the spirit of the game. The other ideas sound like a lot of fun though! I’m a big fan of good cheap fun! Fun ideas! I especially love the grocery store challenge. 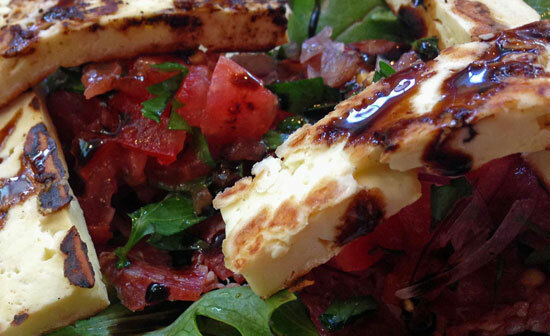 Shopping and then cooking together is always fun, and I love the added spontaneity. Oh, I love DIY! Whenever we have a free time, we usually do movie marathon and going to the park. I’d like to try the #4. It seems that this new activity will bring out our creativity and offer a whole new level of dating and getting to know my wife more. I am so excited and am thinking now which DIY project we’ll be doing. I love the Ready, Set, Cook date. I love having dates at home, where I can cook my own food for a much cheaper price. Ooooh I love Nashville… haven’t been there in years, but man – what great food/music!! #5 sounds like it was from that episode of “Girls” on HBO. Good ideas. I’ve always wanted to try yarn-bombing as a frugal date, but can’t get my husband on board with the crocheting part of it. :) Instead we go the DIY night route a lot or the brownies-and-Netflix-after-the-kids-are-asleep thing. Highly creative. OMG had never heard of that before!!! Had to Google and the pics are hilarious, haha… Love that!! I know, right?! It’s so cool looking! But yes, it would take a lot of prep work and a lot of yarn to really make the right impact. The cooking one is a good idea. My GF and I cook a lot, but that adds a new twist to it! I’m heaps keen to try it again with Amanda but this time bring along nerf guns and shoot each other in the back why sneaking around! Dude… Geocaching? Yes please! I’ve never heard of this before but it looks AWESOME. Totally going to try that. I also agree with #5 being hilarious yet awesome – it’s like role playing… take it as far as you need to. Going to a museum. You don’t even have to know a thing about art, but museums are typically free and you get to see tons of things that other people have created using their imaginations and hands (sometimes). Love doing this. Doing a puzzle together. They cost like $5 at Target and can be a total [email protected]$%. Especially when you mix alcohol in. It’s fun, challenging, and corny – 3 ingredients to make a fun, cheap date at home. Hubby and I are fans of date night in bed which sounds WAY sexier than it actually is, but it just consists of us watching Netflix in bed with a bottle of wine and some popcorn. So the cost of the evening is about $10, and it’s a great way for us to chill out and enjoy our own space. It’s tough to have these with a 9 year old with ADHD in the house, but when we can get them in, we love it. Yes, I’ll agree on that! I just wanted to mention that geocaching is completely free. It’s only $10 for a three month “premium” membership, which you totally don’t need. The website and app are completely free. The premium membership simply “unlocks” like twice as many caches for you to find. But trust me – you don’t need it. You’ll never find all the free ones anyway! Good tip – thanks Samantha!